Involved Parent or Interfering Parent? During my years in the guidance office, I knew that all parents loved their teens with all their hearts. Some just have more productive skills they use with their teens at home. These parenting skills can be learned and used at home with your teens. Just be patient with yourself and practice them consistently. has the ability and intelligence to learn on her own. is strong and has friends who are good influences on her. is able to solve life’s problems – with their help and guidance. is able to make wise decisions – with their help and guidance. is leaning how to negotiate and plan – with their help and guidance. is able to speak with a business-like voice, posture and emotion. see the situation as adversarial between the teacher and the student. display a lot of emotion to their teen regarding school. assume their teen is a victim of the teacher’s dislike. see the situation as isolated or a one-time occurrence instead of having a goal to solve the problem both long and short-term. assume their teen is unable to solve the problem and doesn’t guide him to learn how to solve problems. assume their teen is providing accurate information but don’t look for all the facts. 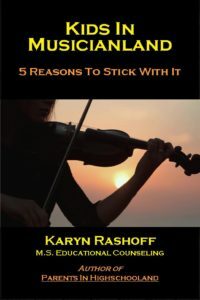 This entry was posted in Excerpts from the Book, For Parents, For Educators, For Students and tagged homework, teens, parents, parent, home, teen on August 11, 2014 by Karyn Rashoff. Math Homework is Math Practice. Parents don’t need to know algebra, geometry or calculus to help their teen be successful in math. It’s the teacher’s job to ensure that students grasp new concepts and assign time at home (homework) to practice new skills. Some students, however, may need more individual attention to learning than the teacher can provide in a fifty-minute class period with thirty-five students. In these cases, parents may want to arrange for tutoring. The school itself is a great resource for help outside of class hours. A list of qualified tutors, either students or adults, may be offered to you by the guidance department or the teacher. The local public library may have tutoring services. Call them up and ask what they offer. Your teen may not be exactly wild about the idea of tutoring, but schedule two meetings a week at your house or the public library with the tutor. Just one hour at a time is plenty. Tell your teen that nobody will know about this; he may be self-conscious that he needs some help. Don’t hover around them; just leave the room. Poor performance in a math class isn’t usually related to not understanding math. Not practicing with homework assignments or not correctly practicing for tests is more likely the problem. I use the word “practice” twice here because that’s what students need to do in math: practice. And the math homework is math practice. Many students feel that if they just put a bunch of numbers on the page they’re doing homework. This is especially tempting if homework is graded with a checkmark or collected as a packet. Really doing the work – not faking or copying it from another student – will make sure that they really understand the concepts. 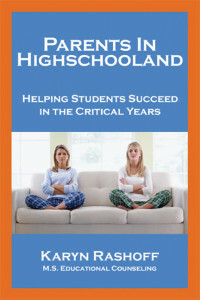 Parents can learn to guide their students in high school. At the start of each school year a ton of information comes home in binders and backpacks. Be sure to ask for it (“What did you bring home that I should read?”) and read it carefully, even though your teen may not offer it to you. In the long run, this information can really help as the school year gets going. Teachers often give points when parents sign that they have read the “Class rules and expectations” and the student returns it. Easy points! Once you establish a normal routine of work to be done at home, you can ease back until you’re out of the homework picture entirely. It’s a matter of setting habits early in middle school or the first months of high school. Yes, it’s time (but not a lot of time) out of your evening if you do it right – but well worth it in the long run. Just think of the future fights that will be avoided year after year if you get on the routine early. This entry was posted in Excerpts from the Book, For Parents and tagged homework on January 11, 2014 by Karyn Rashoff.